Heather Cook, who received her MFA from the Art Center, Pasadena in 2007, was born in Texas but now lives and works in Los Angeles. 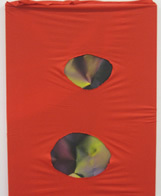 For some time, fabric has been central to her practice - early works combine printed cloth with bulky, painted forms to create pieces that occupy a space between painting and sculpture. 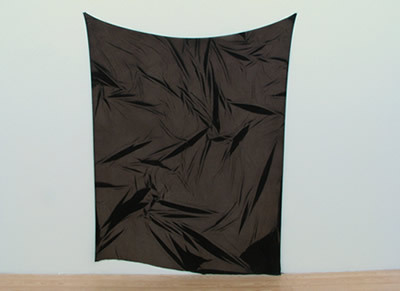 In more recent work, however, this distinction has become more subtle, with creases and folds dyed, silkscreened or bleached directly onto cloth. In many ways, Cook simply reprises the age-old concern with realistic representation of drapery, the twist being that her trompe l'oeil renditions are prepared on soft cloth in which with these properties are inherent, although pinned flat to the wall for display. 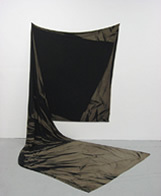 Even more interesting are recent pieces in which she reprises her concern with sculpture, creating works that flow from the wall and into the gallery space, such as the serene Square with shadow, above left. Simple yet beautifully effective, Cook's best work converts fabric into a medium that's far removed from its often folksy connotations.